If you asked either of our sons to do an impression of President Trump, he would squint, purse his mouth, and then say, "We have to build a wall!" They are aware of other Trumpisms and policies, but the wall concept seems to upstage everything else. In the wildly popular (in Japan) manga and anime series, "Attack on Titan," humans live in small cities surrounded by huge walls, attempting to shelter from huge, apparently irrational and monstrous, naked humanoids or "Titans" who roam the countryside beyond the walls, attempting to eat any regular sized humans they can get their giant hands on. Most of the human protagonists of the series are members of the Survey Corps, an elite fighting unit trained in physics-defying tactics to try to protect humanity from the overwhelming Titan threat. The iconic image for the series in its print, film and television formats, is that of the largest of the Titans- "the Colossal Titan" looking over the suddenly insufficient wall, with the hero of the survey corps standing in the foreground, facing him. So what does this have to do with Presidents' Day and Donald Trump? Well, perhaps the wall is enough? There's been a good bit of Trump as Titan in Japan apparently. And some memes involving Trump, the Attack on Titan wall and Mexico. We debated who should be facing off against the colossal Trump on our napkin. The kids suggested the president of Mexico, but this seemed like an obvious and an unfortunate solution to me....and hard for me to convey in a drawing. I felt like the problem inside the wall might be related to the problem outside the wall. In "Attack on Titan," the situation is revealed to be more and more complicated as the series progresses. 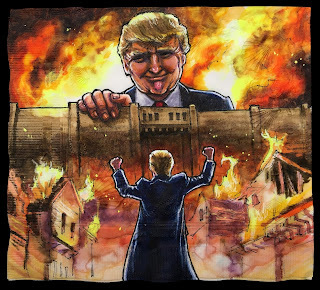 It turns out the politics of the wall are not at all clear cut and that the Titans and the humans inside the walls have more in common than our heroes believed at the beginning. The Titans turn out to be more than just irrational inhuman monsters who lack external genitalia. And regular humans can be inflated to Titan proportions. President Trump has definitely made it clear that the contemporary American political landscape is more complicated and fraught that many (myself included) previously would have thought, and that threats might come from inside as well as outside...or as in "Attack on Titan" even from within the walls themselves.